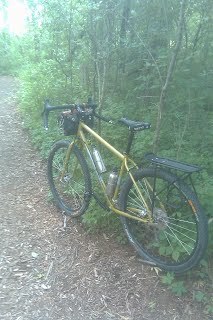 I had tested a Salsa Fargo as a possible option for trail riding, but thought that if I were going to go with the NuVinci Hub I would use an Ogre. 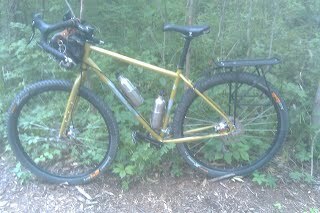 The Fargo was a great bike with a $1,400 ish price range. I stopped into the LBS and they called out my name and wheeled over "my new bike" ..... They had a customer that had order the Fargo and 3 other bikes and picked them up a few days earlier. He rode the Fargo about 20 miles and decided that he wanted to go in a rode bike direction instead... so he brought it back and traded it. So I got it for $1,000. Hard to pass that up . The initial test ride was great. I through on a Axiom Rack that sets back a ways to provide heel clearance when the Panniers are on, put on some Shimano Pedals and I was off. A real nice trail gripping bike. 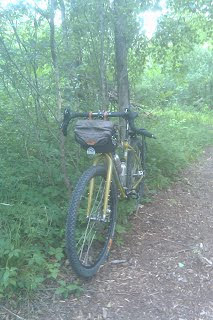 And with the panniers full loaded with groceries, I found that it handles the "errand bike" quite nicely too.